What’s this called?” she said pointing to a horse. The vegetarian question, it occurred to me, would attract unnecessary consternation. Central Asia is a place that history descends upon, where nominal independence remains a hostage to geography, where the Persians, Chinese, Arabs, Mongols and Turks all tried their hands long before Rudyard Kipling called it the Great Game. I’ve always preferred the Russian name for it anyway: the Tournament of Shadows. “Kazakhs are conservative culturally, but they aren’t really religious – they pray five times a week,” she joked. Almaty’s mountains bear over the city as though they are fussing over a small child. I met Dina Baidildayeva, one of few human rights activists in the country – or for that matter the region. Slandered by her detractors and a “feminist and bisexual”, she was annoyed that her taxi driver on the way to dinner had asked her age (she’s 25) and lectured her about marriage. We met Maha’s two closest friends, Fila and Asal, at Apartment, a new shisha bar in the centre of the city. The women are in their late 20s and early 30s and unmarried. Maha divorced her husband after their baby died. Their unmarried status seemed to be an awkward punchline to every discussion. We were asked to join some others to play Monopoly in the upstairs game room, adorned with pictures of western icons such as John Lennon, and Donald Trump’s hair. You have not known furious acquisition until you have played Monopoly with people who grew up in the former Soviet Union. The game finished less than two hours after it started. I asked Fila, who sat with her cash carefully laid out across her legs if this was ponty, the Russian term for showing off in the nouveau riche culture that has developed in the region since the end of communism. “So ponty!” she laughed. With dusk, she and Asal suddenly ran out the door. “Their parents are both very strict,” Maha explained. We left later, when it was dark, and Maha said we shouldn’t be out on the street at night at the moment because the unemployed men returning home from working in Russia are causing problems. If only the men returning home caused the regime as much anxiety as the ones leaving. A few days before my arrival in Dushanbe, news broke that the head of the Tajik secret police, Colonel Gulmurod Khalimov, had defected to Isis and posted a video online trumpeting his conversion. The government, which still likes to play on the civil war which befell Tajikistan at the end of the Soviet Union, in which Islamism played a key role, retreated to their standard response to any mild crisis of turning off the internet, causing a sulk among Tajikistan’s young population, but not before Khalimov had been widely mocked online. Dushanbe doesn’t have Sarajevo’s visible civil war scars, but undercurrents of discontent and paranoia remain. We caught a taxi home down the sweeping Rudaki Boulevard, with its coloured lights and water fountains and hot-pink city hall. Have you ever heard of anything so absurd as a civil war in a city of pastel buildings? The buildings of Kyrgyzstan’s capital, Bishkek, by contrast, feature the dripping stains of decay, as though they weep for their own ugliness. The Soviet monstrosities that line the city mirror each other across the tank-width boulevards. 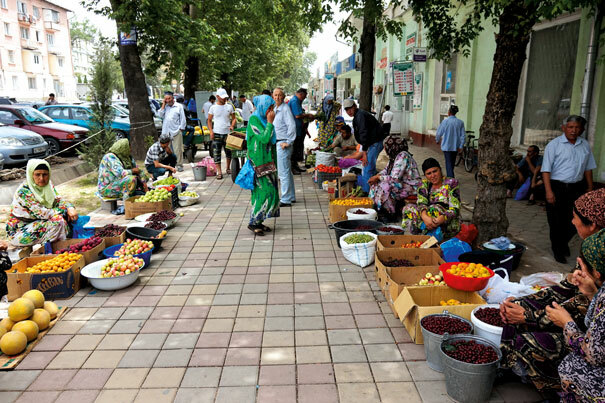 With two revolutions in the last 10 years, Kyrgyzstan is the only place in central Asia that could be loosely described as democratic, and as such, as almost everyone I met in the region would mention, undesirable. For all the inconveniences, strong men are big on construction. The marshrutka taxi out to Issyk Kul played Michael Jackson’s greatest hits, hitting the potholes in time with the dramatic notes of “Thriller” as everyone quietly hummed along. The world’s second-largest Alpine lake and the holiday resort of choice for Almatians, a few hundred kilometres west of Bishkek. The coldness and clarity of the lake is almost spiritual. Floating face down in the water feels like having your eyeballs replaced with polished diamonds; lying face up, all you can see is snow-capped mountains competing with the sun. It was only a brief interlude out to the lake, for Australia were playing Kyrgyzstan back in Bishkek in a football World Cup qualifier. An exuberant middle-aged woman greeted me as I climbed into the marshrutka, the mid-morning chill a reminder that summer in the region has shades beyond scorching. She left the family she had bailed up on the seat opposite to offer me broken biscuits and a swig of vodka from the bottle. It was good for the throat, she explained. She left the family she had bailed up on the seat opposite to offer me broken biscuits and a swig of vodka from the bottle. A thin fidgety woman, whose clothes dated to the end of the Soviet Union, her face was striking, with almost exclusively vertical wrinkles as though she had spent a lifetime grimacing. Each time she drank the vodka – and she could take half a hip-flask in two gulps and no breaths – she retreated into soft moanings and wild gesticulations. She offered it to every person on the bus, who refused, less politely each time. The bus took a break and she shoplifted vodka and Coke before downing another hip-flask by the time the bus had finished pulling out of the driveway. Like everyone else, I pretended to sleep for the rest of the journey back to Bishkek, but all I could think about was the life of the woman with the vertical wrinkles, and what it meant to have grimaced for 50 years straight. 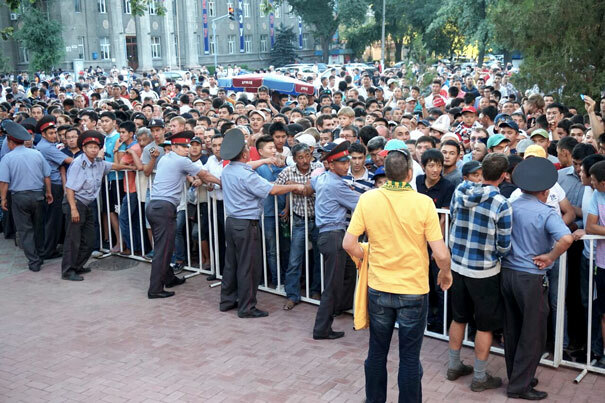 A small number of Australian fans were in Bishkek for the match. We beered early and walked to the game, engaging friendly locals. The near-riot at the barricades outside the stadium, as men tried to push their way in, saw almost everyone, with or without tickets, being turned away because the ground was already full. Crushed against the barricades, and seeing middle-aged men on the verge of tears fearing another Hillsborough, some of us somehow managed to get in. We were ushered to the area reserved for the Aussies. Only to look up was to understand it all: the seats were a marble of blue and khaki; the police and army had taken up every other seat in the ground. Crossing the border between Kyrgyzstan and Uzbekistan requires negotiation of several layers of officialdom. On the Uzbek side, there’s the military man with the AK-47 who does face-control, the man in the white coat who points the temperature gun between your eyes and clicks without warning, the immigration guys who, in the course of questioning your movements, asks you out, and customs, where you must declare all cash, medicines, and technology. My case was handed to the lone woman on duty, a glamorous young woman with Kardashian eye makeup. We settled on French as our best language for communication, even though hers far exceeded mine. Her male colleagues went through my phone, laptop, iPod and Kindle, while she searched my luggage and requisitioned my toiletries. “Vitamin”, “headache”, “nausea”, “contraception”, I explained in some terrible Esperanto, but her supervisor knew all the brand names of opioids. Escorted outside to crush my Valium and scatter it in the bin and the breeze, I tried to think of a way to imbibe some as I remembered I had left a report on human rights on my computer desktop. When we went back inside, we found the dude watching a video of my cat playing with her toy mouse on my phone. It was a month or so after the 10th anniversary of the Andijan massacre, so I told the checkpoints that stopped our share taxi that I was going to nearby Ferghana rather than Andijan, a city that is still generally described by prefacing it with the euphemism “restive”. The Andijan Hotel is the only place to stay in town. It sits next to Navoi Square, the cleansed, manicured, concrete-and-green-and-water-fountains place where the government gunned down 1,000 or so of its citizens in 2005. Searching for heartbeats and sadness, I could come back only to the thought that it must have been easy to hose down. 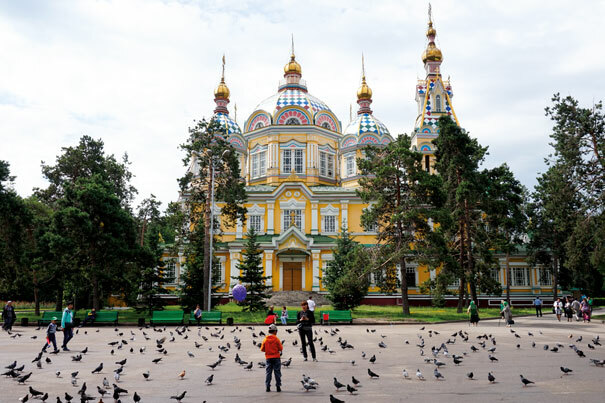 Marshrutka taxis skidded and beeped around the intersection it shoulders as locals floated into the park opposite, with its new ferris wheel and creamy ice cream that makes you think you caught a cloud when you go for a spin in the rickety little carriage. Hannah Arendt was right. Spending time with some local twenty-somethings who had learnt a fair portion of their English from watching Friends and Hollywood romantic comedies further killed the expected sinisterism. Just once, when we were in a car and Sara asked what I knew about her city, I replied: “Something I understand we shouldn’t talk about.” Everyone laughed and fell silent. Rihanna came on the radio and we all sang along to “Diamonds”. Andijan is the most religious part of central Asia. It’s no Qom, but there is a distinct piety. Religion is the thing the Soviets most inadvertently privatised, so it’s culturally ingrained: it’s not the knots in the wood, but the wood itself. We crossed Navoi into the old town to seeFriday prayers, choking in the plumes of dust. The bottle-green uniforms of the cops at the doors of the mosque were unmistakable. It was packed for the first Friday prayers of Ramadan, with many men sitting outside. As a woman, I was not allowed inside. The cop manning the main entrance chased me away, his trousers with a Brezhnev-era flare. The old town is being concreted over and no one seems to either mind or speak their mind. “What are they saying?” I whispered to a local kid as police cars with megaphones trawled up and down the street while we changed money on the black market down a side alley. “We are building,” was the whispered reply. The map of Uzbekistan looks like Italy snapped her toe kicking Sicily. Stalin divided the region into nation states with sufficient ethnic minorities of each other to ensure that they would be more focused on border integrity than succession. Samarkand lies several hundred kilometres southwest of Andijan’s heel, the ancient jewel of central Asia whose people are mostly Tajik. It was the home of the Khan dynasty’s Tamerlane, another ruthless prick, although at least you could forgive him for the architecture. Most of Maha’s relatives live in Samarkand. After the recent government ban on the Tajik language in education, they have sent their children to Russian-language schools to spite the regime. To the visitor, the city is a stately pleasure dome of history, with little chance of encountering politics. It is one of the few parts of the region with more than a smattering of foreigners, and the police presence is notably discrete. While Samarkand basks in its beauty, further to the south Bukhara, Uzbekistan’s other Tajik jewel, lazes. Unmistakably Persian – Tajiks are the only Persians in the Turkic region – its smooth mud-brick domes provide no shade from the heat. Locals say the city is best enjoyed at dusk, but they don’t appreciate the whimsy of tripping through an ancient city, all to yourself, in the middle of the day, even if it is 45C. There are only a few hundred Bukharan Jews left now, after tens of thousands emigrated with the fall of the Soviet empire. It was a Friday when I arrived, as the pale dusk thanked the open-air synagogue for its piety in the face of the obvious. Perhaps 10 men fanned themselves on the arc of wooden benches; the upstairs balcony for women remained empty. A rabbi rocked and chanted as the faithful read the papers, chatted, and drank tea. I slid into a side pew next to Carmel and her teenage daughter. She offered me some green tea. “It cools you down from the inside, even though it’s hot,” she said. “It acts as a thermostat.” We caught a glint of our mutual accents, and she explained that she had emigrated to Melbourne 25 years ago, but her dad, the one reading the prayers, had stayed. It was the first time she had seen him since. After prayers, I met Eduard, who was over from Israel. He was pissed off that Carmel and her family had left, and even more pissed off that they hadn’t invited me to dinner. With a shot of vodka – “It’s a prophylactic” – for each course and the odd one in between, the men told biblical tales and what we should learn from them. Questions about life and community and leaving weren’t entirely comfortable, but they explained how, with remittances, they effectively built a tiny welfare state where education and care for the elderly were paramount. The same idea was the proximate cause of the government crackdown which led to Andijan, so the valour in discretion is something to be understood. We visited the centuries-old Jewish cemetery the next day. There were far more dead Bukharan Jews than there would ever be living Jews in the city again. I had stuffed most of my bras with US dollars and my remaining Valium ahead of crossing the border from Bukhara into Turkmenistan. The fear of cash flight from Uzbekistan makes security on the way out as intense as it is getting in. My wager paid off as there wasn’t a woman in sight, but the Turkmen officials had different paranoias. My friend Nicole went first, and there was no supervisor with knowledge of pharmaceuticals. With five times fewer visitors than North Korea, the guards knew Panadol but weren’t across the contraceptive pill. In time they conceded to her grand play-acting of abortion and concentrated on technology, discovering to our collective embarrassment that my iPhone had a folder that stored deleted photos. If the region is a Petri dish for geopolitics, Turkmenistan is its amoeba. Its ancient cities have mostly been excavated, and at times inadvertently partially destroyed, in the last 40 years. The ruins of Merv remain the near-exclusive domain of foreign archaeology academics and the local camel herders taking a nap in the shadow of ruins to escape the midday heat. Mary, the inhabited city closest to Merv, is as sterile as Andijan, but without the layer of tragedy. With only the museum of terribly Photoshopped adorations of the president to see, the only thing to do is head to the bar, (there’s only really one). There, young men attended to shashlik on an open flame while we attended to beers. If the region is a Petri dish for geopolitics, Turkmenistan is its amoeba. The next day we left for the capital Ashgabat, which prides itself on having the most square-footage of white marble anywhere in the world. Photography is essentially banned in a city which has a desolate beauty that is begging for its portrait to be drawn. But photography is the least of the worries for the residents of Ashgabat, which carries the irony of meaning “city of love” in its non-native Arabic. I met Koray and Zeki, two Turkish engineers working for Polimeks, the corporation responsible for the construction of the statues and buildings of gold and marble. Half of the house they were renting was recently demolished, on days’ notice, in preparation for the city’s hosting of the 2017 Asian Games. The building was in the flight path, so white marble fences were deemed necessary. “They’re about to ban cars that aren’t white or beige, so that nothing clashes with the marble. I guess they’re going to make me dye my beard white too,” Koray jokes. Their Turkish colleagues are freaking out since the signs went up in the office saying even here they weren’t safe from the smoking ban which will completely ban the sale and consumption of cigarettes throughout the country from 2016. Most find Ashgabat alienating, but I can see the beauty in the bizarre little place. As Ashgabat takes the heart, the country’s searing desert steals the loin. The Darvaza gas crater, which lies in the absolute centre of it, was another Soviet accident. Few knew about the gas pipeline that caused a sinkhole in the 1970s. It has now become a minor tourist attraction. The glowing fireball isn’t so formidable in the afternoon, until a swipe of wind welds your fingers to your metal camera lens. The “door to hell” is best encountered with the courage of vodka, late at night, edging dangerously close to the lip to hear her unconscious scream. The sexiness is only broken by scorpions that rattle right up close to you when you find a space in the darkness to go to the bathroom. On the plane, I mused that I had spent too much time viewing the cultures of central Asia through its politics. There is beauty in the baroque, I settled, before waking as the plane landed, having fallen fast asleep on the shoulder of the Turkmen woman next to me. She invited me to return to sleep on her while the plane taxied.